The complete yearbook in German language can be downloaded HERE. 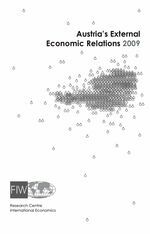 Within the scope of the 'Research Centre International Economics' (FIW) the yearbook on 'Austria's External Economic Relations 2009' has been published. You can download the full text of the yearbook (in German) and the English summary for free. The English summary is a condensed version of the more than 300 pages long publication 'Österreichs Außenwirtschaft 2009', which is published by the FIW and funded by the Federal Ministry of Economy, Family and Youth. The publication provides numerous analyses and comprehensive data on the framework of world trade and on Austrian trade in goods and services as well as Austrian foreign direct investment.